WHAT CAN ELEPHANTS TEACH US ABOUT OURSELVES? A lot, actually. This last week, I had one of those moments that screams at you to pay attention to it. Do you know those times that make the hair on the back of your neck stand up? 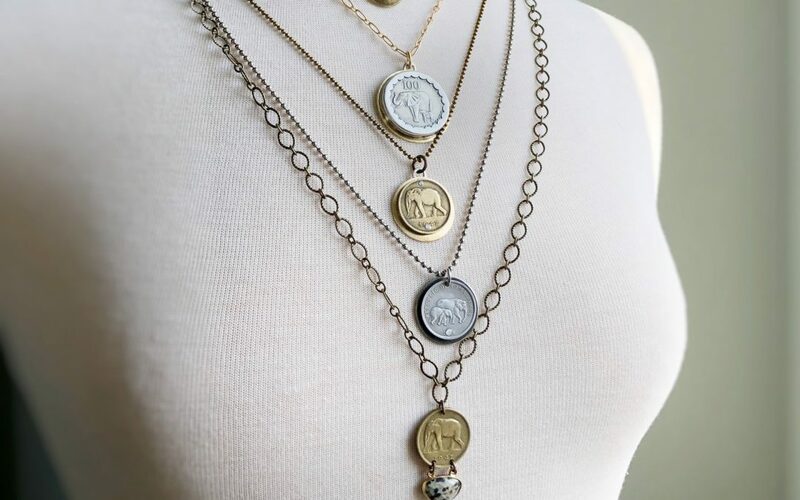 I have been putting together a collection of elephant coins to make jewelry pieces with and have learned so many interesting things about these amazing animals. Elephants are used in many cultures to represent Remembrance, strength through hard times, loyalty to those we love, wisdom and eternity. Elephants have memories that span years. The phrase, “An elephant never forgets” is true. They remember places they’ve been and other elephants they have encountered. Like humans, elephants have a very close-knit family bond. When one of their family members die, they have a mourning period. They often spend hours with the fallen family member holding a sort of memorial service. Elephants know when others are in pain or distress and they use touch and closeness to express concern for those that need it. I heard somewhere that elephants see humans the way we see puppies. Not sure how we would know that but it made me go awwwwwww. Something else (this is the important bit) is that elephants are extremely strong. They are able to uproot entire trees using just their trunks. Just visualize that for a moment. A full-grown tree being pulled out of the ground, roots and all. I spent an afternoon trying to dig up a shrub in my yard last summer and it almost did me in. Those roots were deep and determined to stay where they were. What I am saying is that I am impressed by this fact about elephants. THOUGH THEY ARE POWERFUL CREATURES, ELEPHANTS CAN BE TRAINED. When they are young, a simple rope is tied around their foot and connected to a stake in the ground. Because they are not fully grown, this stake is enough to hold the young elephant. She will test the rope but over time is conditioned to believe that the rope will hold her. As she grows, that belief is ingrained in her so she doesn’t try to break free. On this particular day, however, I just happened to be listening to a brand new workout playlist that I made the night before and it was giving me an extra shot of mojo so I think, ‘I am going to try and get 7 before I hit my knees.’ I did 7, then I thought that there are only 3 more so maybe I can do those too. Which, I did. WHICH BRINGS US BACK TO THE ELEPHANT. Elephants are held by ropes that only have power over them in their minds. They think they are limited by those ropes, so they don’t try. WE MIGHT NOT EVEN BE AWARE OF THEM. THESE ARE STORIES WE TELL OURSELVES THAT KEEP US FROM REACHING OUR POTENTIAL. Thoughts are often like a jerk of a roommate that lives in our heads telling us that we are garbage and that we shouldn’t do anything because Who do you think you are? WHAT IF WE JUST DECIDED TO BELIEVE A DIFFERENT STORY? What if we just decided to give one of the ropes a little tug and see what happens? Have a look at some of the elephant coins I have collected! That was a cool read. I know I limit myself by a dumb ol’ rope. Who says I can’t step out of it? Why can’t I be stronger than a shrub? Time for some goal setting. Thanks! Kelly, you are right on the money with this thought. And yes, elephants are amazing creatures. A lot of this stuff is mental, incredible but true. You can totally psych yourself out, OR…go for it like you mean it. People can truly surprise themselves at their inner strength. Thank you for your great stories and insightful comments. And your jewelry is really beautiful. This is kind of funny but that reminds me of Captain Marvel? Have you seen it? Anyway, I loved how you said, “I wonder what else I can do that I’m unaware it.” It made me wonder if that is kind of the whole point of life. Not to necessarily become anything but to bring awareness to who we already are and what we can already do. I’m going to sit with that one. Thanks for the post Kelly. I love you even more than before. And I love elephants more too. Isn’t is so cool the many ways God shows us truth. Thank you for this beautiful message! So thought provoking! What IF. I decided to give one of the little ropes a tug?!!!! Love that! Love your jewelry so much too! I loved your elephant story! I have order from you before and was wondering if you still sell wholesale?